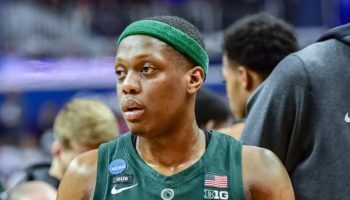 When a college athlete earns All-America status in their sport, they become kind of a big deal. If that same athlete later became a First Team All-America in an entirely different sport, then they’re in a class almost all by themselves. But what if I told you there is an athlete that has done just that, all while taking the school to heights it has rarely achieved previously in both sports? Whether she knows it or not, BYU’s two-sport phenomenon Jennifer Hamson is the “it” girl in college athletics. Hamson, the 6-foot-7 right-side hitter in volleyball, has the Cougars on the cusp of their first national championship in women’s volleyball after their Cinderella run continued with a semifinal win over No. 2 Texas on Thursday night. This comes nine months after Hamson, the 6-7 center in basketball, carried the Cougars to their second ever appearance in the Sweet 16 of the NCAA Women’s Basketball Tournament. Not bad for someone that hasn’t been able to commit to one sport or the other year-round in three years because of those sports’ overlapping schedules on the NCAA calendar. 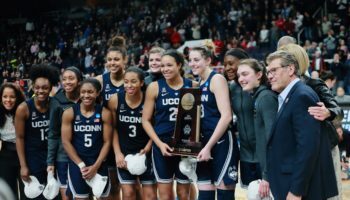 Although Hamson is one of the best athletes in all of college sports, she insists she has been blessed by being surrounded by awesome teammates who have helped her excel. With BYU in tonight’s national championship game against No. 5 Penn State, it’s almost hard to believe the sport of volleyball was on the back burner for Hamson at this time last year. She opted to forgo the 2013 volleyball season to focus on her senior year as a basketball player, the sport her mother – 6-foot-7 Tresa Spaulding Hamson – played at BYU and became a four-time All-American from 1983-87. During the 2013-14 campaign, Jennifer averaged 17.7 points, 11.5 rebounds and led the nation with 4.2 blocks per game on her way to winning West Coast Conference Player of the Year and Defensive Player of the Year. 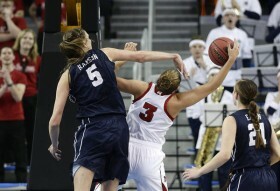 She also garnered an All-America Honorable Mention selection from the Associated Press. 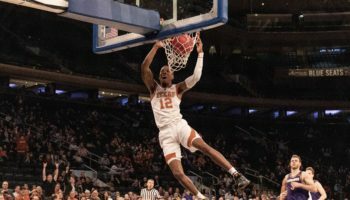 Despite publicly stating her intention to hold off playing basketball professionally for a year to complete her volleyball commitment at BYU, Hamson was selected by the Los Angeles Sparks with the 23rd pick of the 2014 WNBA Draft. One of Hamson’s volleyball teammates, Amy Boswell, believes Hamson playing basketball has helped her with the transition to volleyball. Hamson was far from a slouch in volleyball beforehand, however. In her last full volleyball season, back in 2012, Hamson recorded a team-leading 458 kills and was named the West Coast Conference Player of the Year as well as an AVCA All-America First Team selection. BYU was the No. 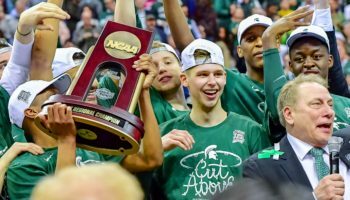 12 national seed in the NCAA Tournament and advanced to the regional semifinals, where they lost to eventual national runner-up Oregon. 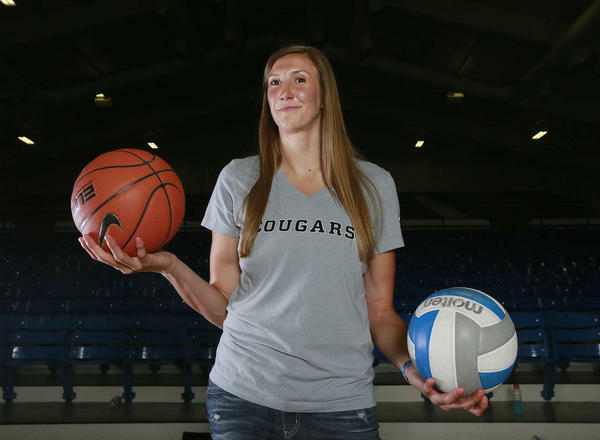 The attention then turned immediately to basketball for Hamson in 2012-13, meaning that while the basketball team was instantly better, BYU’s volleyball prospects for 2013 were thrown into serious doubt. Gray, one of the team’s outside hitters, emerged as a dominant force in 2013, amassing 477 kills while hitting a proficient .305. Like the season prior with Hamson, BYU made it to the regional semifinals, this time losing to USC in that round. But this year, Gray and Hamson have combined to make this tournament run the best in their program’s history. Hamson has 450 kills on the season, with Gray following close by with 415. Hamson says she doesn’t miss basketball right now, even with the bright future ahead of her in the sport. Honestly, how could she miss basketball when she and her teammates are in the throes of making history, becoming the first unseeded team in the history of the tournament to reach the championship match? Much like the rest of the season, Hamson was virtually unstoppable in Thursday night’s semi-final match against Texas. She led her team with 22 kills in the thrilling four-set win against the No. 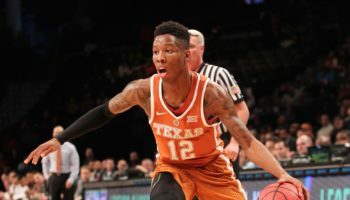 2-seeded Longhorns. She also tallied 10 digs and seven block assists, a standout all-around performance from an all-around student athlete. Olmstead said he’s really proud of the athlete and person Hamson is for BYU. Hamson will decide soon on whether she wants to play basketball professionally or try out for the USA women’s volleyball team. For now, she’s just trying to enjoy the last few moments of her life as a student-athlete – and a collegiate supernova. “What she decides after this, I have no idea and I don’t ask her,” added Olmstead. Hamson may not be the “it” girl in college sports for too much longer, but the next one might actually be in her family. Her younger sister, Sara, is just a sophomore in high school, but she is almost as tall as her older sister (6-foot-4) and just recently won a Utah state volleyball championship at Pleasant Grove High School last month. Another similarity between older and younger sister is where they are mentally in deciding their immediate futures.